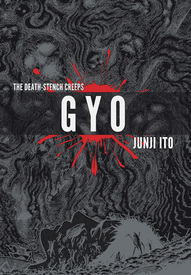 Here it is: the complete collection of the horrific precursor to Junji Ito's cult classic, Uzumaki. Gyo presents page after page of pen and ink terror, as nature runs amok, shocking and terrifying the population of this coastal community. This volume also includes two bonus horror tales b Ito: " The Sad Tale of Principal Post," and "The Enigma of the Amigara Fault," making for 400 pages of classic horror manga in all.